Summit County recognizes October as Cyber Security Awareness Month and advocates good cyber security practices year-round. We're helping local residents and our own employees better understand cyber risks and guard against them. By implementing cyber security strategies in our own everyday lives, we can work together to protect our economy, national security, infrastructure, personal finances, identity and privacy. Recognizing the importance of cyber security to our nation, President Obama designated October as National Cyber Security Awareness Month. National Cyber Security Awareness Month is designed to engage and educate public- and private-sector partners through events and initiatives with the goal of raising awareness about cyber security and increasing the resiliency of the nation in the event of a cyber incident. National Cyber Security Awareness Month takes place each October and is sponsored by the Department of Homeland Security in cooperation with the National Cyber Security Alliance and the Multi-State Information Sharing and Analysis Center. We now live in a world that is more connected than ever before. The Internet touches almost all aspects of everyone’s daily life, whether we realize it or not. We connect with friends and family, conduct business and banking online and rely on many services, like transportation and electricity, that are supported with online systems. Technology has spearheaded advancements in healthcare, education, business, music, government, and many other industries. As technology advances, our lives become easier and more connected. Being constantly connected brings increased risk of theft, fraud and abuse. No country, industry, community or individual is immune to cyber risks. As a nation, we face constant cyber threats against our critical infrastructure and economy. As individuals, cyber security risks can threaten our finances, identity, and privacy. Since our way of life depends on critical infrastructure and the digital technology that operates it, cyber security is one of our country’s most important national security priorities, and we each have a role to play—cyber security is a shared responsibility. Keep your operating system, browser, and other critical software optimized by installing updates. Be cautious about what you receive or read online—if it sounds too good to be true, it probably is. 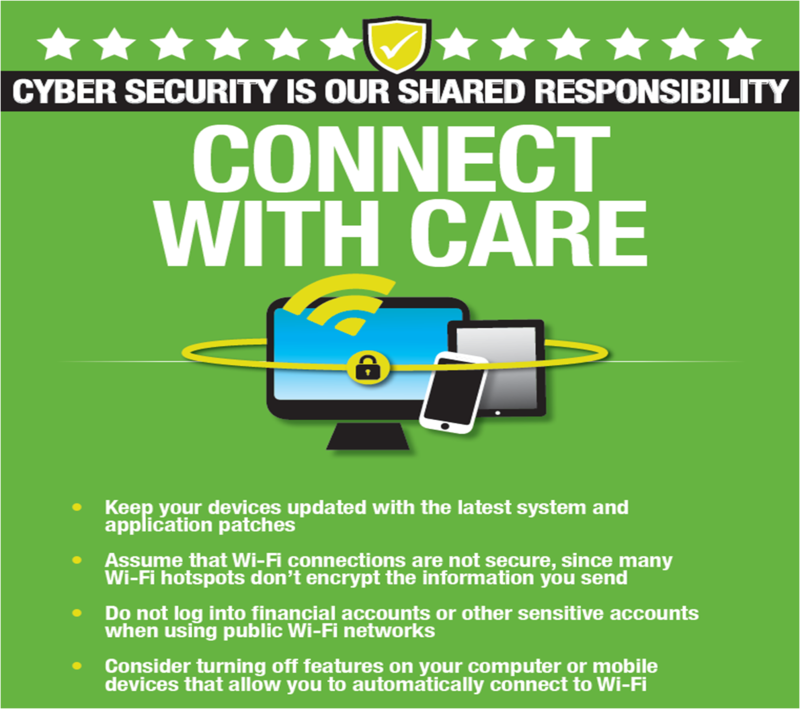 For more information on how to practice cyber security during National Cyber Security Awareness Month and throughout the year, visit Stop.Think.Connect.